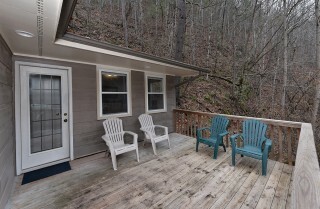 Overlooking a peaceful mountain creek, this 3-bedroom, 2-bathroom chalet in Pigeon Forge with space for 6 features beautiful Smoky Mountain style, cozy and stylish interiors, modern amenities, and 2 decks where you can soak up the peace and serenity of the Smokies while sipping your morning coffee or having a drink before climbing into the soothing hot tub at night. And with no chalets or cabins in sight, you’ll feel truly tucked away in the mountains! 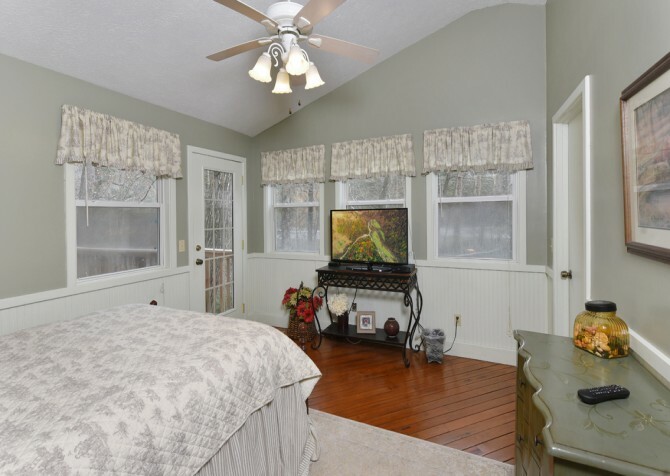 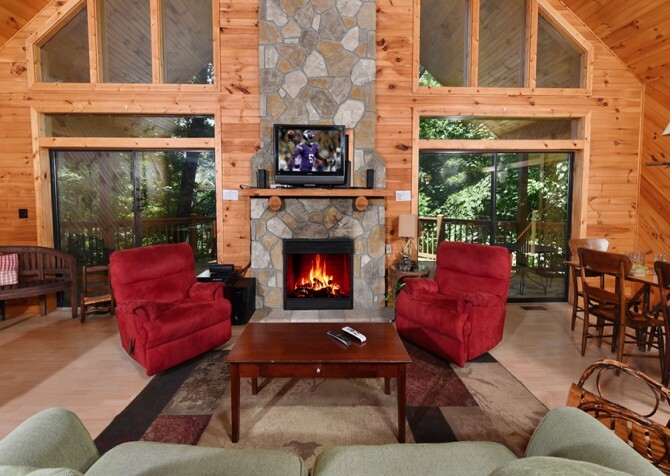 Spend days here cozied up in front of the wood-burning fireplace, watching movies on the big screen TV with DVD player, or just relaxing and chatting with friends and family. Everyone can gather at the same time in the living room, just steps from the fully equipped kitchen where you can whip up snacks or create delicious meals for the group. 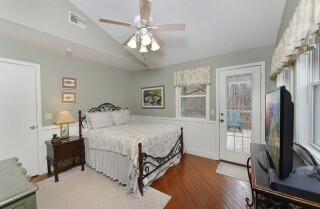 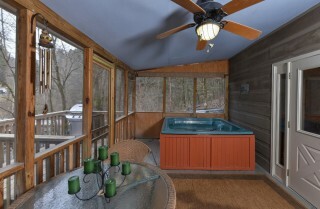 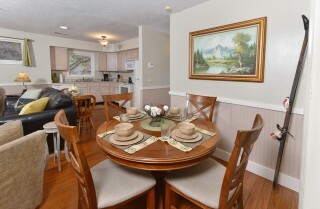 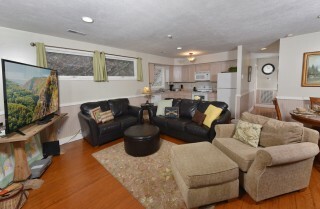 On the screened-in porch, enjoy meals at the table or relax with family and friends in the bubbly hot tub. 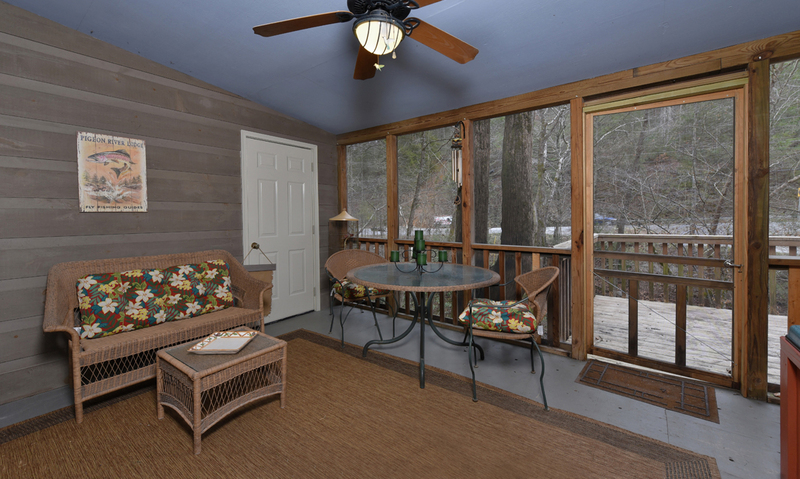 No matter the weather, you can enjoy some fresh air and peaceful wooded surroundings in this enclosed outdoor space. 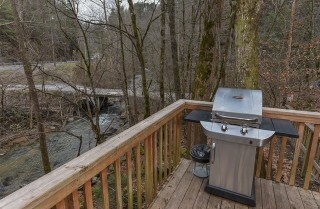 Then step onto the open deck to fire up the gas grill for cookouts and get some sunshine. 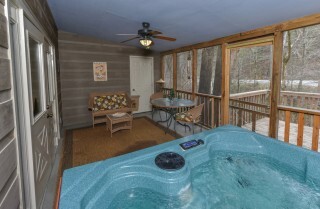 As you hang out, listen to the sounds of the soothing stream just below for a true mountain experience. 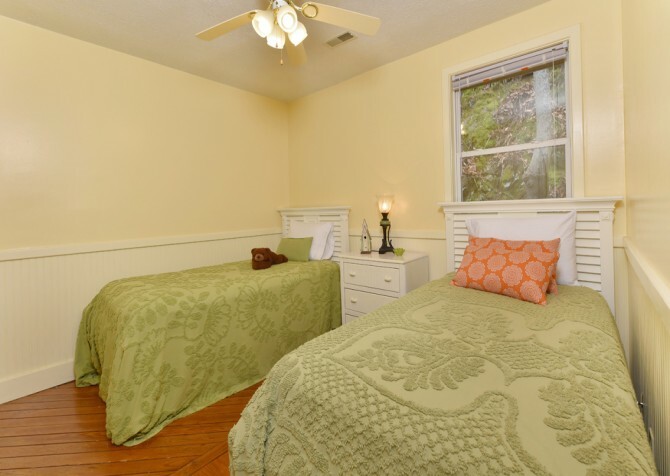 Back inside, cozy bedrooms make you feel right at home with 2 queen-size beds and conveniences to make your stay more comfortable. 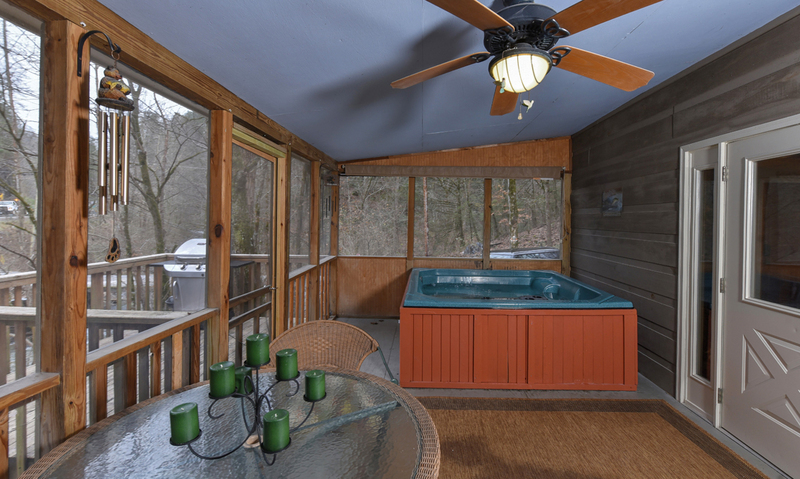 You can soak in the indoor jetted tub, take advantage of the washer and dryer in the chalet, or just kick back and surf the web via the complimentary Wi-Fi at Up the Creek — a prime chalet choice for YOU! 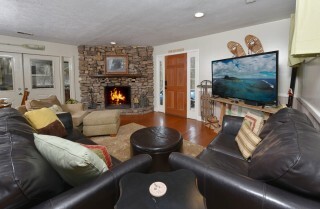 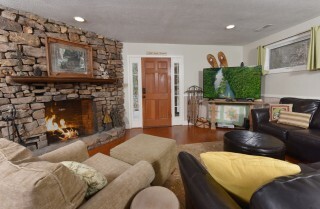 Step into the cozy living area, pop a few pieces of wood into the lovely fireplace (with stone from floor to ceiling), and settle into your Pigeon Forge vacation rental — it’s memory-making time with family and friends at Up the Creek! 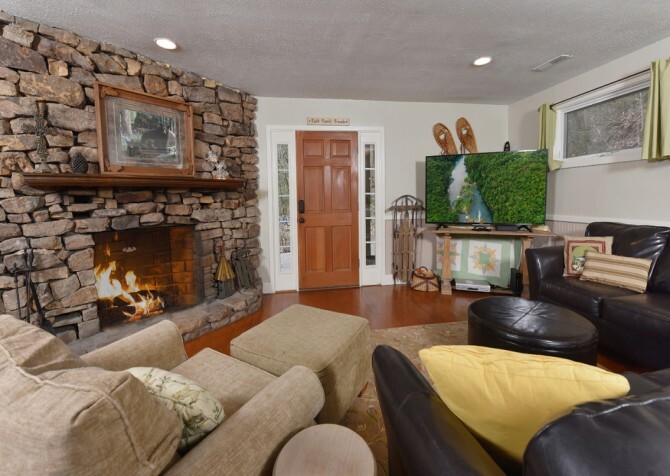 Sprawl out on the sofa for a midday snooze, flip on the big screen TV for movie night with the DVD player, and prop your feet on the ottomans for a late-night read. The open concept keeps everyone connected, whether cuddling on the love seat, whipping up a homemade meal, or playing board games at the dining table. Mere feet away lies the kitchen, fully equipped with everything you’ll need to prepare secret recipes, movie-night popcorn, midnight snacks, and hot breakfasts. 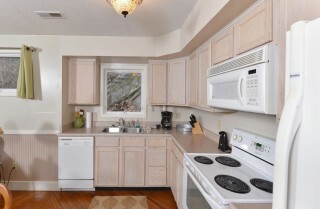 The kitchen is airy with a window over the stainless-steel double sink, light cabinetry, and white appliances. Keep drinks cool in the fridge, cook tasty dishes with the stove and oven, microwave restaurant leftovers, brew a pot of coffee, and leave the mess to the dishwasher. 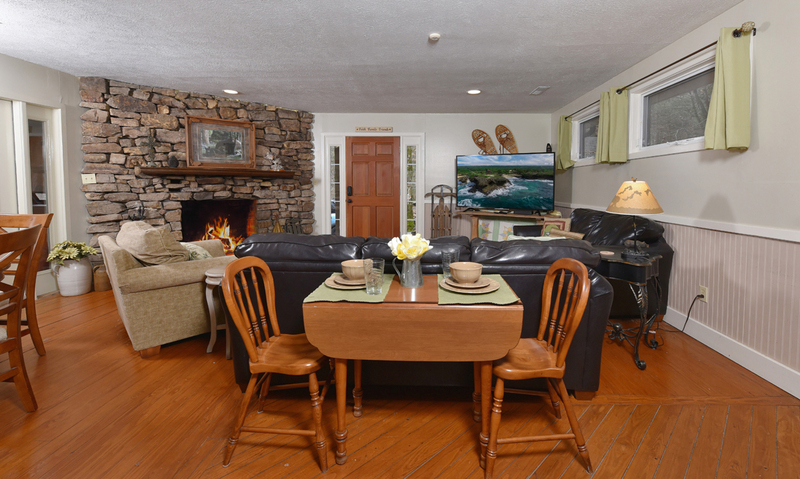 While an expandable table for 2 rests behind the sofa, a round table for 4 with cushioned seating awaits in the dining area. 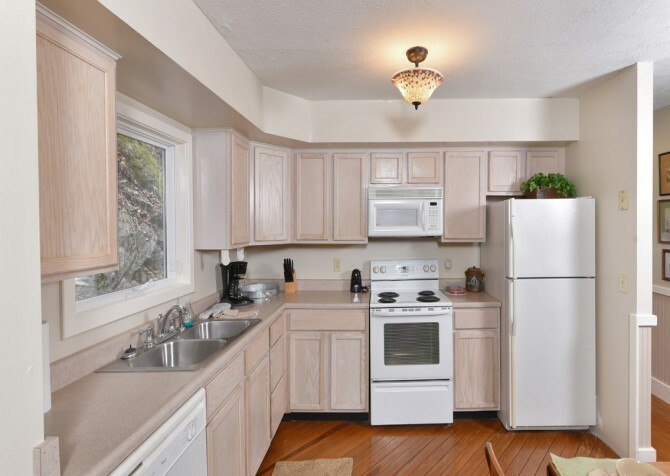 Keeping close to the kitchen for easy serving and seconds, this dining space is convenient, quaint, and well within sight of the living room’s big screen TV. Whether you desire to keep the kiddos entertained with their meals or prefer to dine without any distractions, the dining area at Up the Creek is versatile. In fact, this space is great for board or card games from home, checking emails throughout your stay, or simply coming together to plan the day’s in-town activities. Ready for a restful night’s sleep? Tuck the little ones into the 2 twin beds, say goodnight to your friends in their queen-size bed, and venture to the master suite with a queen-size bed and a private deck overlooking the trees with glimpses of the sparkling river. 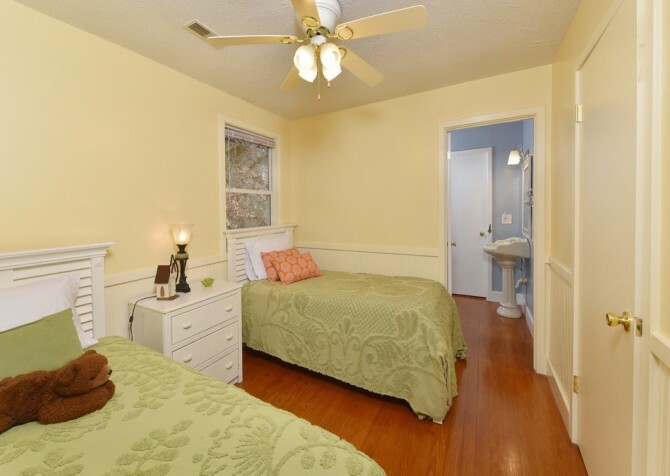 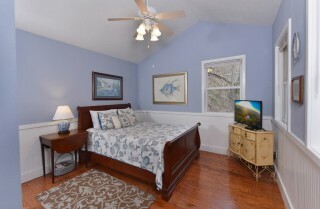 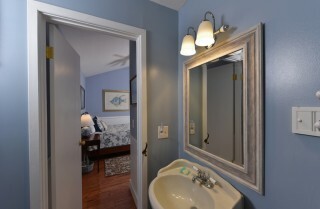 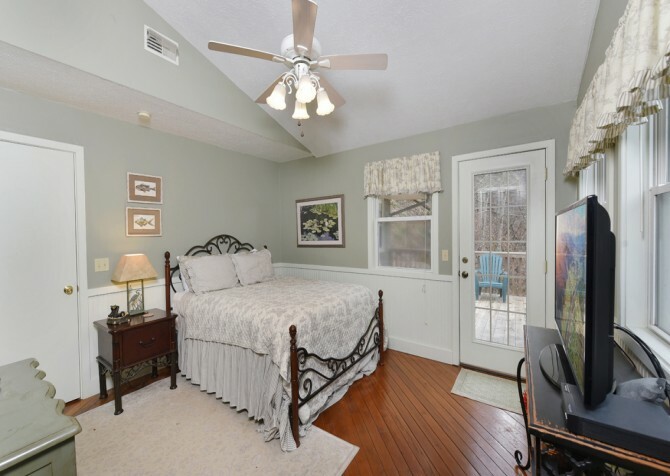 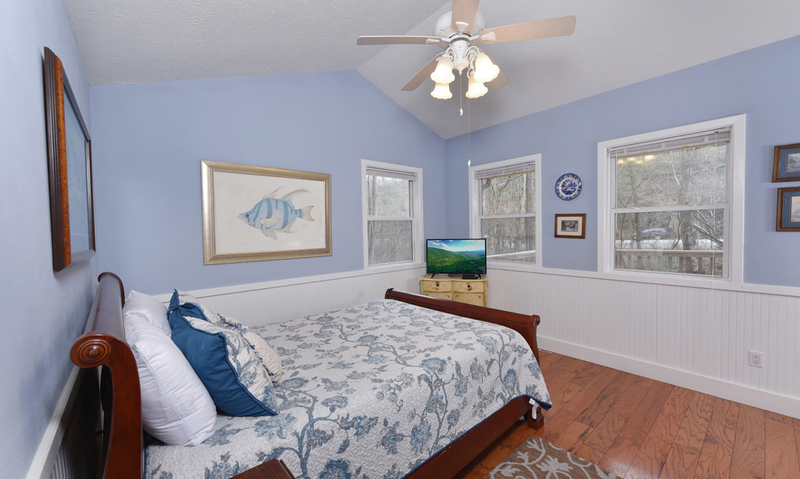 Each bedroom has a ceiling fan for optimal summer comfort, and 2 of the bedrooms harbor a flatscreen TV for extra entertainment before bed or after sunrise. 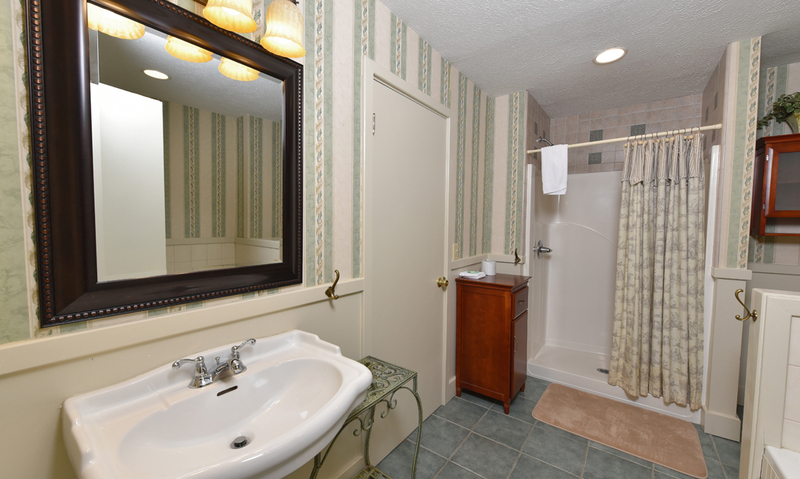 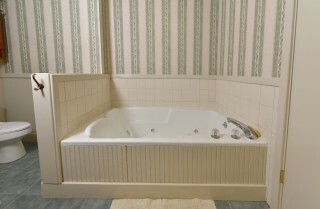 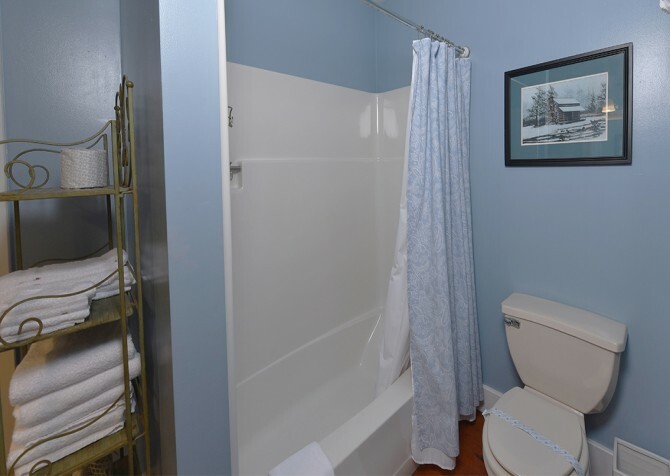 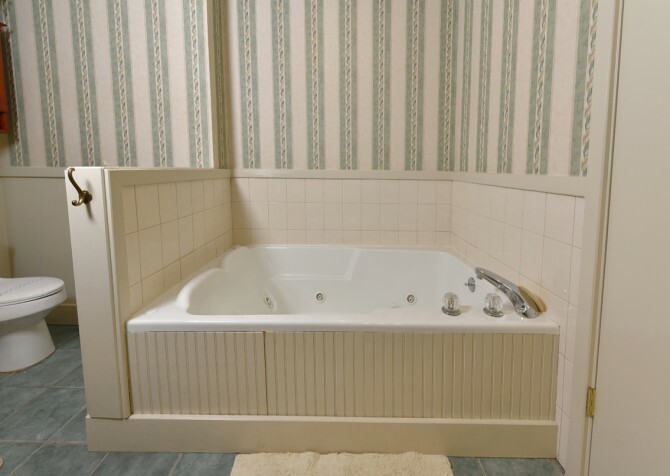 And let’s not forget the jetted tub just down the hall for relaxing spa baths any time! Outdoors is where you’ll want to be at Up the Creek — offering a private deck upstairs and an open deck with a screened-in portion on the main level. 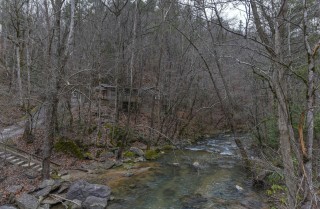 Not to mention, this Pigeon Forge chalet has tranquil wooded views all about with a rushing river just below (happily peeking through the trees). 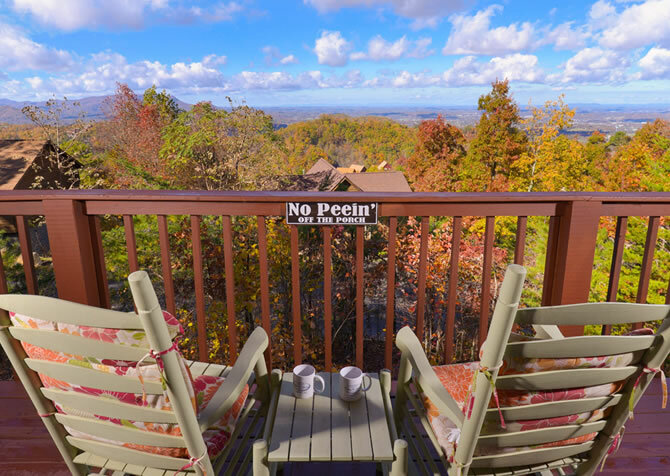 Enjoy privacy with nature as you sip coffee on the upper deck, then nibble breakfast at the outdoor seating area with friends. Before the evening sun begins to set, fire up the gas grill for a barbecue party, followed later by a steamy hot tub soak. Great for summer days, the ceiling fan keeps you cool outside. Looking to take a closer peek at Cove Creek? Head safely down the steep, paved driveway to a set of stairs that leads directly to the river’s edge, where you can cast a line or simply enjoy the scenery and movement of the crystal water. 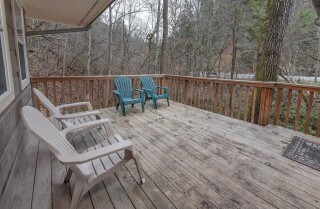 At the top of the drive, you’ll find parking for 2-3 vehicles and only 3 steps into the chalet, making it easy to unpack and load the cars at this semi-private cabin in Pigeon Forge. 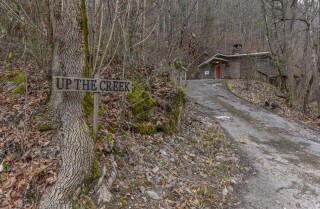 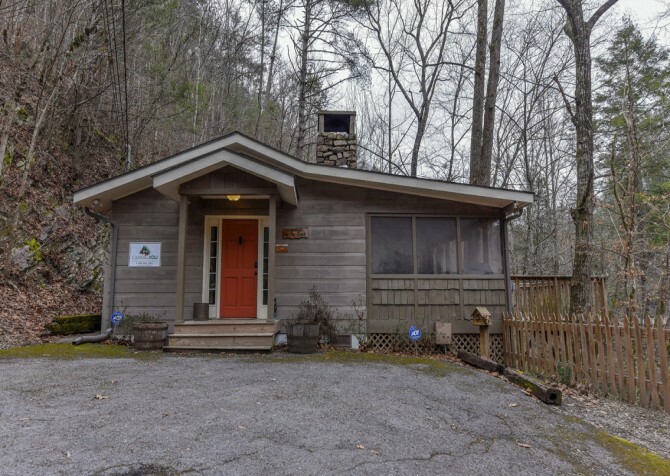 As your new favorite vacation rental in the Smokies, Up the Creep provides the conveniences of home, including high-speed wireless internet for posting to social media, keeping tabs on important emails, and checking out the Cabins for YOU blog. 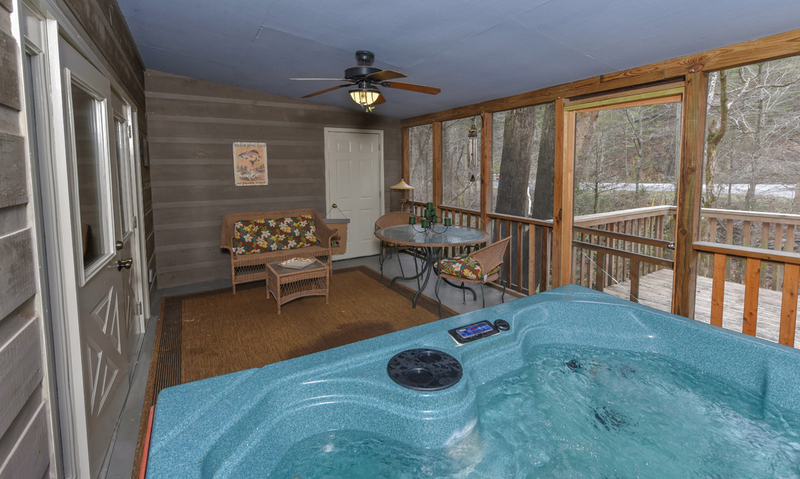 You’ll also be able to use the chalet's washer and dryer so you can keep clothes and towels fresh and pack light this trip. Around 7 miles to downtown Pigeon Forge, Up the Creek isn’t too far from local attractions, boutiques, restaurants, and outdoor fun. 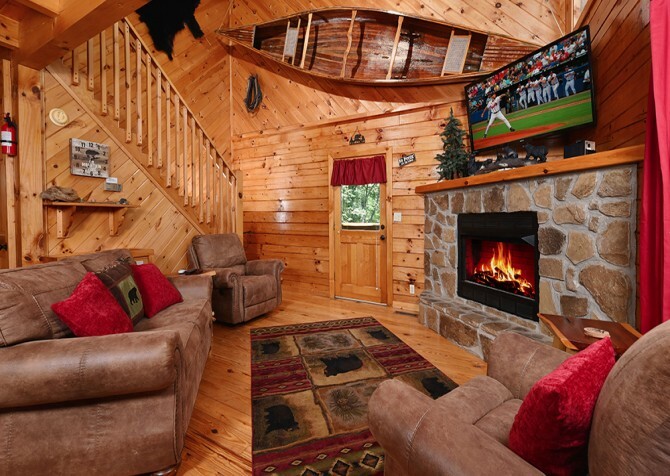 So, be sure to plan for exciting extras to pair with your memorable cabin stay! 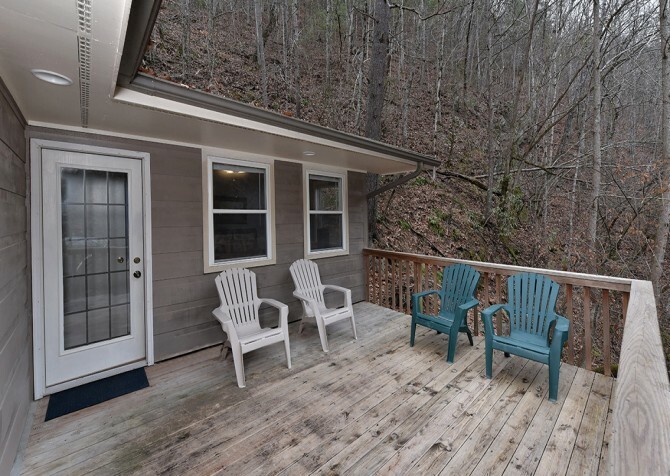 Grab a cool souvenir at Moonshine Ridge Country Store, featuring garden décor, gift baskets, and homemade treats (including fudge, salsa, and jams). 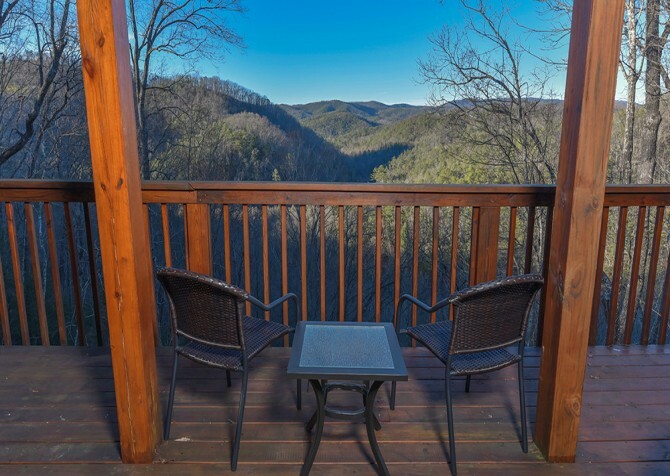 Zoom through the trees at unimaginable heights at Wears Valley Zipline Adventures, where happy screams and smiles for miles are aplenty! Stick closer to the ground as you whip through the woods, over fun hills, and around sharp turns aboard the Smoky Mountain Alpine Coaster!